Copyright law is a critical issue for authors, librarians, publishers, and information vendors. It is also a complex area, with many shades of gray. Librarians continually need to seek answers to questions ranging from the reproduction of copyrighted works for library users, through the performance of audiovisual works, to the digitization and display of protected works on library websites. 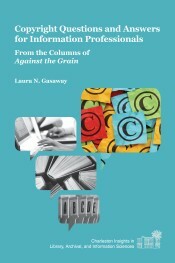 This book presents updated versions of the author’s copyright columns published in Against the Grain, the leading journal in acquisitions librarianship since the late 1990s. It is the first volume in the series Charleston Insights in Library, Archival, and Information Sciences. The aim of the Charleston Insights series is to focus on important topics in library and information science, presenting the issues in a relatively jargon-free way that is accessible to all types of information professionals, including librarians, publishers, and vendors, and this goal shapes the pragmatic and accessible tone of the book. The volume is presented in question-and-answer format. The questions are real, submitted by librarians, educators, and other information professionals who have attended the author’s copyright law workshops and presentations or submitted them to her by e-mail or telephone. The author has selected the questions and answers that have general applicability. She has then arranged them into logical chapters, each prefaced by a short introduction to the topic. Because it is written in an accessible and clear style, readers may want to review the entire work or they can just access particular chapters or even specific questions as they need them. The volume includes an index to facilitate reference use. 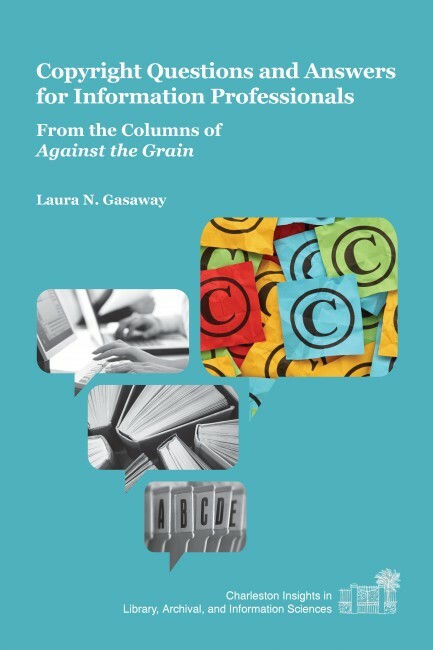 "Librarians and other information professionals will appreciate Gasaway's ability to make the complex and often bewildering copyright environment relatively straightforward and uncomplicated. Copyright Questions and Anwers for Information Professionals deserves a place on the desk of any librarian dealing with copyright issues, especially those at risk-averse institutions." You may be thinking, “My library already owns half-a-dozen books on copyright issues in libraries. Do we really need another?” Absolutely. Copyright Questions and Answers for Information Professionals should be part of all academic law library reference collections for those specific questions for which you need a quick answer. It is accessible to all readers, regardless of whether or not one has any copyright law knowledge. Similar books tend toward in-depth summaries and explanations of copyright law that may still leave the reader at a loss as to how to address specific questions. Professor Gasaway’s book is quite the opposite, clearly and succinctly providing just enough explanation to enable the librarian to make an informed decision and move on. Laura “Lolly” Gasaway joined the faculty of the UNC-Chapel Hill School of Law in 1985 as director of the law library and professor of law. In 2006 she became associate dean for academic affairs and served in this position until 2010 when she became a full-time law teacher and was named the Paul B. Eaton Distinguished Professor of Law. Gasaway was law library director at the University of Oklahoma from 1975-1984 and at the University of Houston from 1973-1975. She is a past president of the American Association of Law Libraries. Gasaway coauthored Librarians and Copyright: A Guide to Copyright (1994); edited Growing Pains: Adapting Copyright for Education, Libraries, and Society (1997); and Law Librarianship: Historical Perspectives (1996). She co-chaired the Section 108 Study Group for the United States Copyright Office from 2005-2008 and is a member of the Board of Directors of the Copyright Clearance Center.